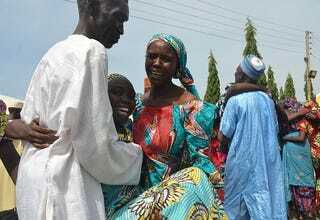 More than 80 Chibok, Nigeria, schoolgirls were reunited with their families Saturday, about two weeks after their release by terrorist group Boko Haram, according to the Nigerian government. In April 2014, 276 schoolgirls were captured from their school by the militant outfit, which pledged allegiance to ISIS, or the Islamic State group, prompting the global hashtag #BringBackOurGirls. CNN reports that the young women, now 18 to 21 years old, were gathered with their families during a ceremony in the capital of Abuja. After receiving intensive medical attention, the young women will be enrolled in a remedial program that will prepare them to go back to school. Twenty-one of the former captives already live at the facility. The government freed five top Boko Haram commanders in exchange for the most recent release of young women. “There’s no price too high to pay,” said Nigerian Sen. Shehu Sani, who was part of the negotiating effort. Their release brings to 106 the number freed by the militants so far, the government said. Fifty-seven schoolgirls managed to escape the militants soon after their capture, while two others were found by the army. Another girl was found in May 2016 when she wandered out of a Nigerian forest asking for help, according to witnesses. Discussions to free the remaining 113 girls were due to begin late last week.